We had quite the scare on this day. This dog nearly hung himself. Luckily we were there to save him. Have you ever payed out the expense for a kennel, or even a fenced yard, or dog tie out. Just to have your dog still escapes or break the cable and puts themselves in harm’s way, either choking or getting run over in the street. After nearly hanging himself trying to escape from the kennel we hooked him up on the Pristine pet anchor with a Tangle Free swivel feature, and he was safe and secured the rest of his visit. but the other did not giving the string double length. 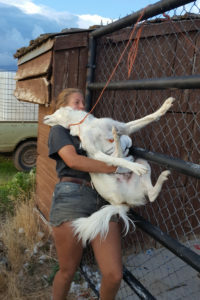 Just enough to allow the dog to climb the fence…..but held tight after the length ran out, choking the dog. LUCKILY, we got to him before it was too late. After lifting the dog in the air to release the tension I soon realized the string was so tight around his neck he still could not breath. After enrolling Jade to help me by holding the dog. I ran to the house for scissors. Upon returning he was struggling for air. The string was so tight I found it difficult getting the scissors under the string to cut it. He wiggled around trying to get air, which made it even more difficult to cut the string. Finally the string was cut and the dog gasped for air. 2: If a fence will not keep your dog in and you must use a dog tie out, may I propose an alternative to what is currently in the market today. 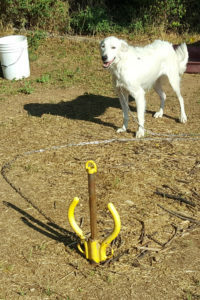 The Pristine Pet anchor, with a chain, it’s easy to drive in and out of the ground and swivels to prevent choking. This little guy is much safer now. Thank goodness.